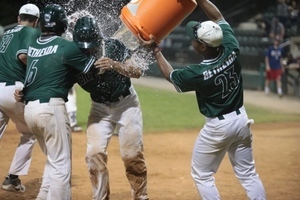 The team celebrates with a water bath as Carson Taylor knocked home the tying run and later scored the winning run on a passed ball. After losing the lead in the top of the ninth, Big Train had their work cut out for them in the bottom of ninth, trailing 5-4. After a string of quality at-bats and timely hitting, Carson Taylor (Virginia Tech) darted home on a wild pitch as Big Train walked off to earn their 28th win of the season. With the score 5-4 in the bottom half of the ninth, Ben Martz (Santa Barbara CC) stepped to the plate to begin the conquest to take down the Braves. After watching two balls go by, Braves pitcher dropped two nice curveballs for strikes making the count 2-2. Martz then roped a single just out of reach of the third baseman and the comeback started. Fox Semones (James Madison) promptly laid down a perfect sac bunt to advance Bryan Diaz (Nova Southeastern), who subbed in as a pinch runner for Martz, to second base. After the Braves pitcher got Tyler Villaroman (San Francisco) to sharply line out to right field, it was up to Taylor to come up in the clutch. And he did just that! Taylor ripped a ball over the first baseman's head, scoring Diaz from second, and tying the game at five runs apiece. The Braves then brought in a new pitcher to face Big Train slugger Alec Burleson (East Carolina). The Braves unwisely walked Burleson to put men on first and second. Some chants by the late-staying crowd proved to be the helping hand for Big Train,as the Braves pitcher threw three wild pitches in his at-bat to John Glenn (California Baptist), one of which scored Carson Taylor, giving Big Train the comeback victory. See video https://twitter.com/GoBigTrain/status/1016870906226978818. Before the late inning thrills, Bethesda put together a solid outing. In the first inning, Fox Semones scored off an Alec Burleson single. In the second, Big Train tacked on another run, this time via a single from Tyler Reis (Waynesburg) which scored Jacob Westerman (San Francisco) who reached base on a walk and moved over after a sacrifice and a wild pitch. Big Train struck again in the sixth on a Justin Wylie double which scored a hustling Alec Burleson all the way from first base. And for the second time in the night, Big Train scored in back to back innings. This time Fox Semones had a de facto inside the park homerun. After doubling down the right field line, the Braves players made some errant throws that allowed Fox to score. The pitching from Big Train was great once again. Tuck Tucker (Maryland) started the game and looked strong going 4.2 innings allowing two earned runs on 4 hits while striking out 4. Jordan Poore (Florida Atlantic) took the mound for the second time all season and went 2.2 innings allowing no runs on one hit, while also stranding two inherited runners in the 5th inning. Anthony Piccolino (James Madison) and Ryan Metz (Virginia Tech) finished out the game for Big Train. Metz earned his league-leading fourth despite only pitching .1 innings. His ERA remains 0.00 on the summer. 15 Big Train players will be back at Povich Field tomorrow for the CRCBL All-Star Game. First pitch at 7pm.